This chapter breaks down the process and application of community engagement projects within a department of architecture, at an urban-serving research university. As a matter of policy, the department requires community engagement projects in all design studios, and as such, promotes a culture of engaged learning. 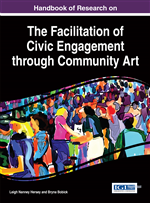 The authors present an overview of engaged culture based on their experiences with community engagement projects, including strengths and areas for improvement. This is supported by the presentation of an arts-based project involving plastic reuse that brought together university students and primary school students. The authors conclude with recommendations for sustaining a culture of engagement, including aspects they seek to implement as they continue to foster engaged learning and further their own engaged scholarship. Today, the fields of architecture and interior design frequently use the term sustainability to describe a major movement in which practicing and future designers should participate (Wang, 2013). As with most professions, entities engaged in educational preparation lead the way: Both accrediting agencies, the National Architectural Accrediting Board (NAAB) and the Council for Interior Design Education (CIDA), include sustainability in the standards used to evaluate those programs. As such, sustainability (as a term and as a movement) figures prominently in the way the authors work in the fields of architecture and interior design education. What is notable about the small department where they work is that community engagement is central to the pedagogy concerning that education. It appears in the mission of the department (which follows from the greater mission of the university) and is directly incorporated into the main teaching tool—the design studio—where the synthesis of design activities takes place. To present the role of community engagement projects in higher education, by discussing a department culture focused on community engagement, and how that looks in the curricular structure. This includes a description of department policies and course documents, including syllabi and project statement requirements. Supporting this discussion is knowledge gained through several internal grant-funded course redesigns. To present a specific example of an arts-based community engagement project that engaged multiple community partners, including one that involved primary school students. In support of these objectives, the authors present background information on the significance of civic engagement within the disciplines; a review of the current culture of the department; an overview of the role of mentoring; and, the details of the community-based project itself, with supportive pedagogical foundations. The chapter concludes with lessons learned from the project and from the authors’ greater participation in a culture of engagement. The history of community service in architectural education can be traced back to the social movements of the 1960s and 1970s, and the incorporation of the discipline of sociology into the field of architectural study (McLeod, 2012; Ockman, 2012; Schuman, 2006). It was also a product of the combination of architecture and planning, an interdisciplinary study meant to serve communities by understanding how the built environment could be influenced by the human experience (Schuman, 2006). This led to community-based design services, as well as design-build services. Underpinning the allocation of educational resources to serve others was a thoughtful perspective geared toward the designer's social responsibility; specifically, what it means to be a professional and a citizen. For certain entities (Bell & Wakeford, 2008; Public Architecture), social responsibility is self-evident; however, it is not a universally accepted avenue for the professions (Wang, 2013). In the department where the authors work, community-based projects are part of the ethos of the teaching and professional culture, a means to serve others, as well as to connect the department to the university as a whole.1 A small department (approximately 100 students and nine full-time faculty) must be able to clearly articulate the means by which its faculty and students satisfy parameters set forth by the greater whole. That is, because the department is part of a greater research university,2 it must be able to present to external parties how it fulfills the trifold relationship of teaching, research, and service, and ultimately, how each of these supports student learning. This depends upon clearly defining the mission of the department, and setting goals that reflect the intent and execution of the mission, combined with commitment from faculty, students, and community partners. Community engagement: A partnership between the studio professor, the students, and an individual or group outside the department that requests assistance with developing ideas as they relate to architecture, interior design, urban design, and planning. Design Studio: A three- to five-credit-hour course that meets two to three times per week (three to four hours per session), centered on the execution of individual and group design work that is, upon completion, presented to a panel of professionals for review. Sustainability: An understanding of the cyclical and reciprocal nature of humans and their interactions with the built and natural environment. Upcycling: The concept that all products, processes, and services have an infinite life cycle that is healthy and nurturing to humans and the planet, which is improved upon in future iterations of the product or process, not degraded.